April is a great time to visit New York City. 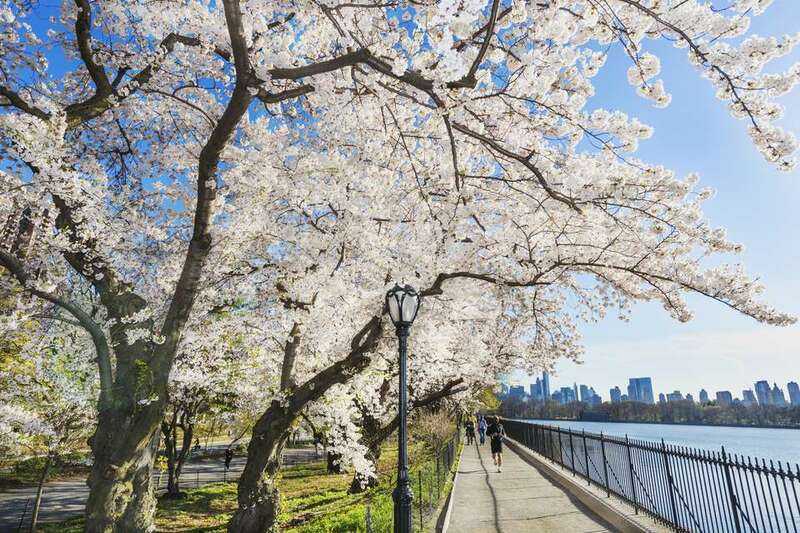 With Easter, the Tribeca Film Festival and the Macy's Flower Show all taking place, there are many fun events throughout the month. There is also the promise of warm weather; New Yorkers are all out in their summer dresses and sandals enjoying de-thawing from the winter. April school break also makes it a popular time to visit. The only downside is the weather can be both wet and unpredictable. You'll still want to pack plenty of warm clothes, particularly if you're visiting early in the month, as it can sometimes feel colder than you expect. It can even snow in April, though it's not terribly common. April can be rainy. There is an average of over 4 inches of precipitation in April. But the warmer temperatures make it more comfortable than March. There is also very little humidity this time of year, so when it's not running, the air is clear and crisp. Pack an umbrella -- you'll be happy to have it when it starts to rain, but don't worry if you forget. The moment a few raindrops start to fall, you'll notice lots of vendors selling $5 umbrellas on the street, and there are also options at CVS and Duane Reade. Pack sweaters and long pants to wear -- it can be cool, particularly at night. And when it's wet, it feels even colder. Layers are key to comfort when visiting NYC during this month since the weather can change from cold and rainy to sunny and beautiful, even over the course of just a few hours. Warmer weather means outdoor activities are more inviting. You can visit some of New York City's great parks, take a walking tour or just enjoy strolling Fifth Avenue. Also Central Park's growing greenery is great to visit in April. The Easter Parade is a great chance to have an "only in New York" experience. Millions of people walk down Fifth Avenue in their Easter bonnets. Some of them even have costumed pets. The Macy's Flower Show takes place at the beginning of April. The iconic department store creates elaborate displays made entirely out of flowers. It's a sight to behold. The New York Botanic Garden stages its annual Orchid Show in April. In addition to seeing these gorgeous flowers, there is music, dance, and food. Tribeca Film Festival - This annual film festival has grown since it's inception in 2002 and now features roughly 300 films with screenings at a variety of locations around the city. Opening Days at Yankee Stadium and for The Mets at Citi Field - The start of baseball season marks the official start of spring for many sports fans. Earth Day - NYC hosts a variety of events around town to educate the public about how to live a greener and more earth-friendly life. Many American schools have spring recess in April -- a week off of school. Depending on the year, the week might be different for different areas -- often, NYC schools are out a different week than neighboring districts. This week can be a popular time for vacationing families to visit New York City, and the city can be crowded. Easter Weekend can mean closings on the Friday before Easter, as well as on Easter Sunday. However, Easter Monday, which is often a holiday in Europe, is not commonly observed and will have little impact on stores, restaurants and New York City institutions. For more resources about New York check out the New York City Calendar.